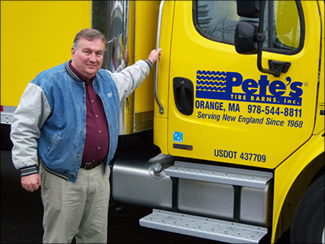 Pete’s Tire Barns is headquartered in Orange Massachusetts at the site of a former Grout Automobile factory. A historic site that is home to our corporate offices, as well as our Orange Retail store and one of our Bandag Tire Retreading Facilities. For almost 50 years, Pete’s Tire Barns has been focused on providing high quality tires, tubes and tire service to both retail and commercial customers. 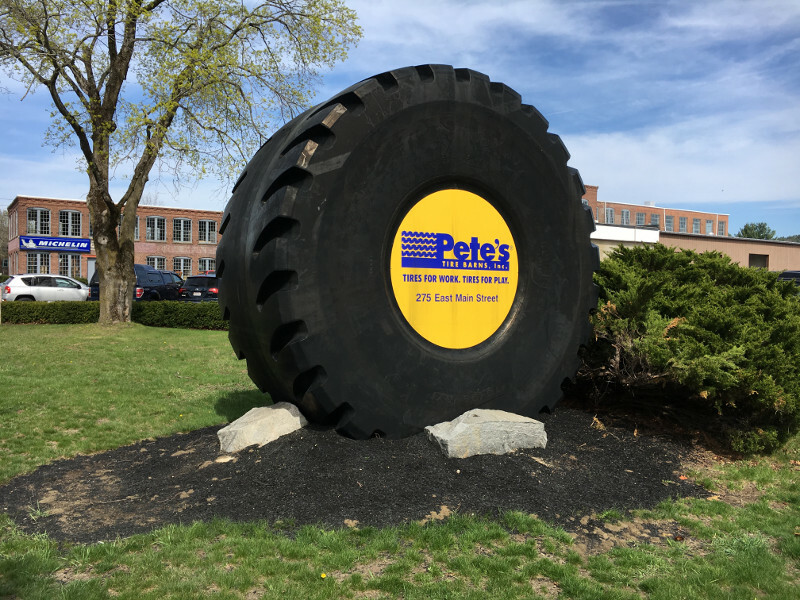 Pete’s Tire Barns is known for many things including being the home to one of the largest and most diverse tire inventories on the east coast. One way that people identify Pete’s Tire Barns is by the large tire out in front of the facility. Our corporate headquarters is home to a Firestone 70/70-57 Super Rock Grip loader tire, the world’s largest working tire! The tire, which was featured on History Channel’s Modern Marvels was designed specifically for the LeTourneau L-2350 Loader, a mining machine which is designed to center-load haul trucks with capacities of up to 400 tons and provides an operating payload of 160,000 pounds, a 24-foot dump clearance and an 11.5-foot reach. The tire weighs a staggering 15,000 lbs (equivalent to a school bus) and stands over 13 feet tall. The retail price for the tire is approximately $167,000. The tire consists of 48 plies of rubber (enough to cover an Olympic-sized swimming pool) and takes approximately 40 people and 88 hours to build using a combination of advance technology and old-fashioned hand-craftsmanship. The beads are constructed with 640lbs of steel which would equal about 20 miles when completely laid out.